For many, a cup of coffee is an integral part of their morning ritual. Shower, pack lunches, drop the kids off at school, pick up a cup of coffee and head to work. Unfortunately, if we aren’t careful, this ritual can sneak hundreds of calories into our mornings. As you can see in the infographic, the calories in your drink can add up quickly, depending on what you order. Not only can the calories make a dent in your daily allowance, but also, most of them come from sugar. In fact, many of these drinks have the same amount of sugar as a can of Coke; in some cases, it’s twice as much. If you’re not careful you’re going to start your day with a sugar spike, which can leave you feeling drowsy — pretty much the opposite of what you want from your morning coffee. Not only that, but if you order the same drink every weekday morning — say, a white chocolate mocha — this can add up to over 2,000 calories a week! Removing the whipped cream on top of your drink can save you about 70 calories and half the fat. Instead of 2 percent or whole milk, opt for nonfat milk or coconut, soy or almond milk. Oftentimes, dairy alternatives will have no-added-sugar options, too. 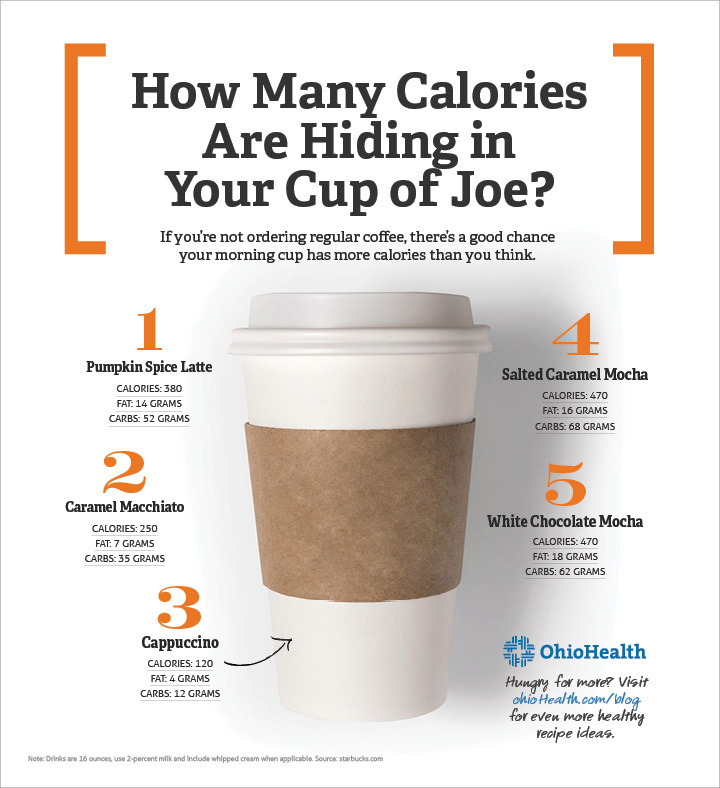 By reducing your drink size from 24 to 16 ounces, you can cut a third of the calories. A switch to 12 ounces will cut sugar and calories in half. Plus, do you really need a drive-through coffee every morning (and afternoon)? Making that cup of joe at home will help your health — and your wallet. Worried about controlling your blood sugar? Learn tips and tricks for keeping your blood sugar low.